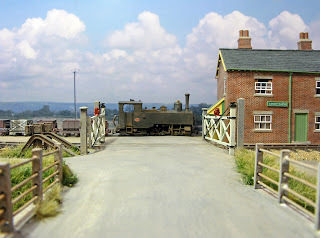 "Most of us would secretly quite like a model railway layout, especially when you see these attractive little scenes created by the railway photographer Chris Nevard." The above from the Daily Telegraph Online took me a little by surprise, actually I'm quite chuffed, even though this temporary moment of glory is all about us Brits and our nutty hobbies. This of course means that I am officially a nutter. Still, I've known that for years, but now it's official! Cheese Rolling is in the same feature too, and because that's something that no doubt makes all the wet health and safety limp wristed luny lefties twitch, this in my book is really quite cool - I'm honoured to be along side them! 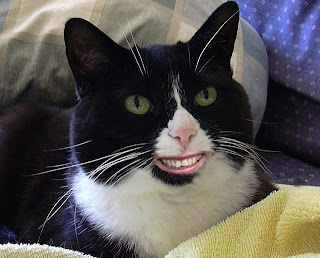 The cat picture (Smudgie our human/feline clone) is purely here because I couldn't think of a picture to post. 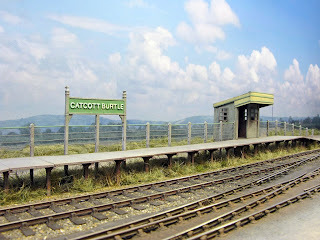 Bit of a bumper update for Catcott, with yesterday seeing a few trees finished off from copper wire originals. Bend wire > solder joins > cover thicker bits in masking tape > cover in Humbrol Dry Clay (might as well use it up) > paint in thick PVA to strengthen > add a fine gossamer of Woodland Scenics microfibre > spray a mist of matt black and grey primer over whole tree > spray microfibre with photomount > dust on Anita Decor & Silvia 'tree foliage' scatter > adjust colour with 'Ford Laural Green' (Halfords) > Place under layout lighting > realize looks too emerald > adjust with diluted biege/greeny matt emusion PVA mix through an artist's diffuser > have a Westons Cider. Gottit? Other growth (much still loose, just positioned for appraisal - only rear fixed so far), scatter coated seafoam, rubber nag's hair (what happens to the horse, is it still alive, dog food or a 'plat du jour' in Paris? Guess we'll never know, let's not think about it...) and some Heiki tree foliage. Re-coloured as per the trees. Have another cider. 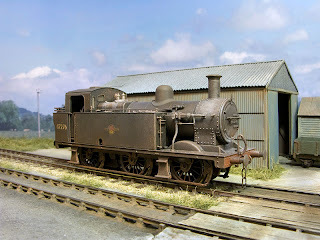 The loco is a weathered Bachmann one, renumbered to reflect one of Radstock's finest or worst, depend on your viewpoint. On the former S&DJR, these engines were mainly used as bankers, the 3 link rather than screw coupling being correct for this particular engine. They did make the odd sojourn down the Highbridge Branch from time to time. 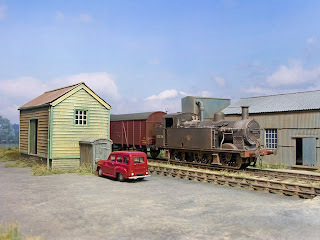 The photographer's spanking new Austin A30 Countryman (Springside) contrasts well with wheezy LMS heap which is performing a spot of shunting (Parkside Dundas LMS CCT). The area just to the right of the car is likely to be a small coal dump. 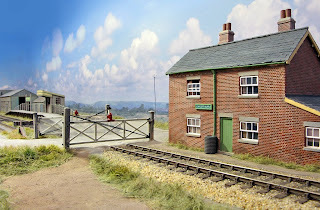 The pic to the left of Catcott Crossing Halt, shows the attack of the hanging basket liner earlier today. It will be trimmed, using small scissors and a vacuum cleaner to make it stand up. It will then be sprayed (a brush will be used upder the platform) very lightly with a highly diluted PVA/yellowy/browny/greeny emulsion mix using a toothbrush. Then, with an old vacuum cleaner it will be vacuumed again whilst wet to make sure the grass is still as upright as possible. The grass under the flatform will be left messy, the grass at the rear will be trimmed more so it looks less like the mower has been emptied. The glue/paint mix ultimately sets hard and stops the shreds of hanging basket liner breaking off and going everywhere it shouldn't. The courser ballast is sand from the Solent strained through a fine sieve, something I've been using for years (Combwich). I did a test section the other night with some Green Scenes stuff but it didn't look right, it looking like old tea leaves in colour once dry. The beach sand is tiny pebbles, being almost round, the grains literally roll into place. It also takes PVA well too, in fact alot better than granite or whatever it is that the scenery suppliers give us. aka ‘transforming a smart Austrian, into a rusty, old & possibly English style leaking wheezer geezer’. 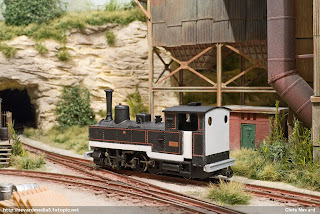 Having thoroughly enjoyed the feature by in a recent 009 Socielty Newsletter on how to anglicise the Bachmann Liliput HO Zillertal Bahn 2-6-2 a couple of months ago in 009 News, I remembered that I had one of these locomotives hidden in the garage collecting dust. It was from one of those spur of the moment purchases a couple of years before, probably because I feared it was going out of production. 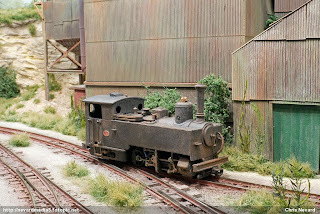 The loco, after a good couple of hours running round and round Arne Wharf (where it really looks the part I hasten to add), runs beautifully. The only problem is that due to the large overhand and my tight curves, most stock, irrespective of which way around the loco is facing, tends to get pulled off the rails on the bends! 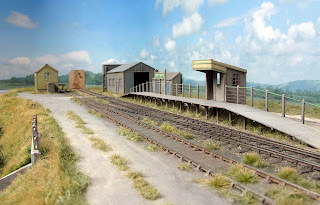 Oh well, better build another layout!